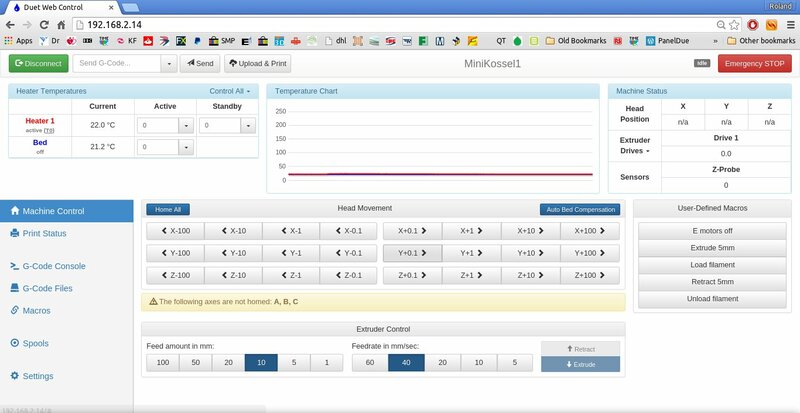 We have been selling our version of the Mini Kossel delta 3d printer for 15 months now. As is the nature of RepRap projects it has evolved along the way. We have marked these tweaks and upgrades and improvements as different versions of our kit and we are now ready to release our 3rd version - the Think3dPrint3d Mini Kossel Release 3. Though it builds on our other upgrades it is by far the most significant revision yet. More detail is set out below but in summary we are switching to 32 Bit Duet Electronics, 20x20 extrusions, IR probing for true autocalibration, as well as some other more minor improvements to the usability or ease of assembly of the printer. Of these the single biggest change is using the Duet electronics with David Crocker's improved RepRap Firmware which allows for segmentation free delta printing and easy autocalibration. Since David implemented delta support in the RepRap Firmware we have had many enquiries about buying the kits with the Duet (and some customers chose to help out as unofficial beta testers). It has taken until now for us to bring everything together into a kit form, including the detailed documentation, to ensure builders will get the same great experience assembling this version as the previous ones. The new Duet V0.8.5 also has 2 extruder channels and so allows an easy upgrade path to dual extruders without an extension board, like the RAMPS in previous versions of the Mini Kossel, but unlike previous 4-channel Duets. David Crocker's RepRap Firmware takes advantage of the ARM chip's 32-bit processing power to provide true segmentation-free delta movement for improved smoothness and accuracy. Unlike most 8-bit firmware like Marlin, RepRap Firmware is precompiled and there is not normally any reason to modify or recompile it. 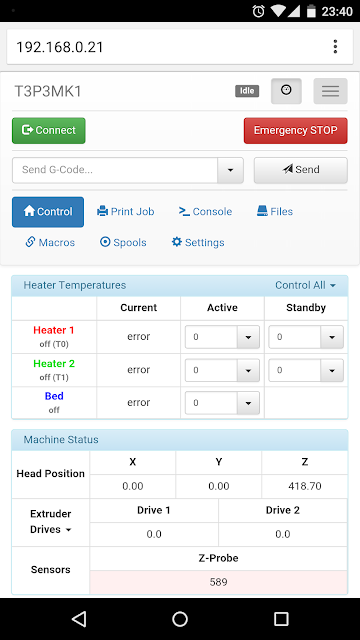 The firmware is easy to configure with all the settings controlled through Gcodes in simple text configuration files. David has documented the setup of the configuration files in some detail on the RepRap wiki, for Cartesian printers, Delta printers and CoreXY printers. The Ethernet support allows direct connection to a network or ethernet port on a laptop, or connection via Wifi. The web interface by Christian Hammacher is simple yet powerful and can be run on any device that is on the same network as the printer. These provide increased frame stiffness and allow the use of T-slot nuts which can simply be dropped into the extrusion channels when required, making assembly much easier. David Crocker also developed a really great mini IR probe which, when combined with the functions within RepRap firmware allows for quick and accurate printer setup and calibration. Hot end assembly showing DC42's differential IR probe mounted next to the E3D V6 heater block. The extruder and E3D V6 hot-end are preassembled and tested. While the majority of our customers have had no issues since we switched from the JHead to the V6 in Release 2, a few have struggled with the V6 assembly. As this kit is designed for hassle free assembly we want to eliminate all the potential issues. The V6 is assembled, heated to 290C and the nozzle tightened in accordance with E3D's recommendations. We have included a top mounted spool holder for some time now, along with other tweaks and improvements suggested by our customers. For a full specification of the kit see our website. As with everything we do the changes to the printed parts are available on our Github. We are also finalising the design and kit contents, and working on the documentation for a much larger Kossel, based to a large extent on David Crocker's supersized Kossel. It will optionally have a E3D Cyclops/Chimera dual extrusion hotend, 24V power and a massive 300mm diameter by ~480mm high print area. If you are interested in getting your hands on a Beta Kit then feel free to email us! Update 17 November 2015 - all 10 beta test slots have now been taken. This looks a great improved kit. I loved building your original Kossel Mini. I am modding it now. I recommend this R3 kit to anyone who wants a great experience and fun. Looks great! Have just about finished assembling my version 2 so a bit gutted that I didn't wait a couple of months and have a chance to buy v3. For those of us with v2, how big are the changes with regards to print quality and any plans for introducing an upgrade kit or similar to let us go to v3? Maybe just the electronics need replacing? Hey the v2 has excellent print quality at medium speeds (50mm/s set in your slicer), what the v3 brings is in terms of quality mainly the electronics allowing for higher speeds on complex objects with many small segments. The electronics also give better user interface and easier calibration. The other changes are mainly to make assembly even easier. We are looking at a v2 to v3 upgrade kit, and will probably go with a solution that keeps the hardware of the v2 and just replaces the electronics and part of the wiring. Replacing the extrusions and thus a bunch of the printed parts would be a major pain to rebuild. I will blog about the plan once it is firmed up. whats the min layer size of that printer ? 0.1 mm? and does it print abs without problems or does it need special addons ? With the 0.4mm nozzle we supply as standard with the kit 0.1mm is a realistic minimum layer height, although you can go slightly lower if you spend a bit of time tuning the pinter. If you want to go significantly lower then the best bet is to use a smaller nozzle diameter (0.25). We can supply smaller genuine e3d nozzles (although we don't routinely stock them) or you can get them directly from e3d. Wth a 0.25 nozzle customers have successfully printed down to 0.05mm. I don't suggest you start with such a small nozzle though as its better to get it all calibrated and working at larger layer heights fist before fine tuning down.